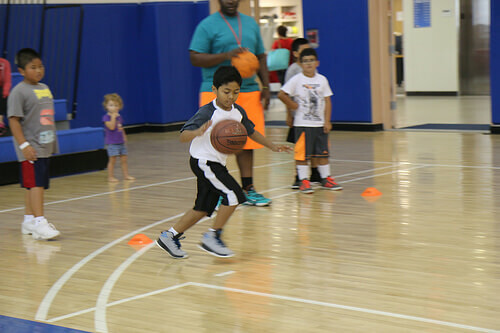 Dynamic youth basketball dribbling drills are the best way for young players to develop their ball handling skills. The set of drills below teaches ball handlers how to get past defenders by changing their direction and speed. Each basketball move is used for a different reason depending on what the defense is doing at the time. When first starting out the drills should be done slowly, then as skills and confidence improve speed up. A second ball can then be added when appropriate to make them even more challenging. The goal is to continue making your comfort zone bigger by mastering new skills one at a time. Players at all levels are encouraged to work on these skills daily. Practiced regularly, they'll see improvement in their skills over time. I highly recommend you add some basketball court markers to your training equipment. There are lots of great uses for them during practice drills. Purpose: Used on a fast break to get the basketball up the floor in a hurry when no defenders are in your way. Push ball – Push the ball out in front of you, so you have to run to stay up with it. If you dribble it too close to your feet, it will really slow you down or you may trip on it. Full speed – Go quickly before the defense can catch you. Straight ahead – Take the shortest angle to the basket or wherever you're headed. Eyes up – Always keep your eyes up, looking down the court. Don't get distracted by looking behind you over your shoulder. Don't get caught looking down at the ball. You'll miss open teammates down court or fail to see scoring opportunities that develop. Waist-high dribble – This allows you to run full speed without having to bend over to dribble the ball. Keep ball near side – Avoid dribbling the ball in the middle of your body. If you're dribbling with your right hand, it should stay on your right side out in front. If you're using your left hand, keep it slightly to the left side of your body. This keeps the ball out of the way of your feet, so you don't get tripped up. Purpose: Sometimes a defender gets in your way, but she's out of position or back on her heels. A quick hesitation dribble is all that's needed to get by her. Perform the speed dribble as described above. Dribble 3-4 times at full speed then stop moving forward. Continue dribbling, but pause in this spot for one dribble, and then sprint forward again for several more dribbles. Stop again for one dribble and sprint forward again. It may not seem like much, but this small hesitation is all you need at times to get the defender off balance. Once she gets out of position, you blow straight past her. Purpose: When you're being closely guarded, this dribble allows you to move the ball up the floor while protecting it from the defender's hands. Right hand dribble - With ball in your right hand, face sideways to the direction you're going with your right hand behind you. 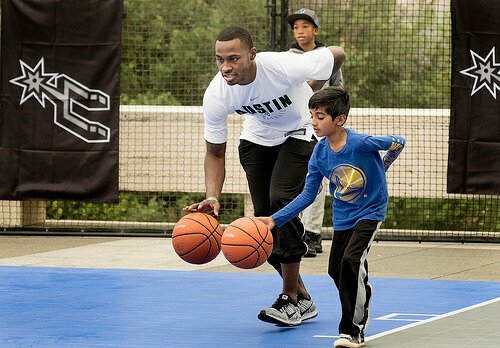 Dribble the ball behind your right foot, keeping it close to your body and bouncing it no higher than your knee. As you move up the floor, your feet kind of shuffle so that you always keep your right hand and ball behind you, away from the defense. The left forearm stays bent ("arm bar") and shields the ball from the defender's hands if she tries to steal it. Left hand dribble - With the ball in your left hand, face the sideline so that your left hand is behind you. Dribble the ball behind your left foot, keeping it close to your body and below your knees. As you move up the floor, shuffle so that you always keep your left hand and ball behind you, away from the defense. The right forearm stays bent in front of you to protect the ball from the defender's hands. When your defender is leading you to the sideline you need to change direction so you don't go out of bounds. When a defender jumps in your way you need to change course before you run him over. When you see a passing or scoring opportunity on the other side of the court you need to get over there as quickly as possible. When you find yourself in a trap you need to be able to back out of the trap and head another direction. The following youth basketball dribbling drills teach a variety of ways for players to change direction. Purpose: When you need to back away from defensive pressure. When the defense is closely guarding you and you're doing a control dribble, you may find yourself in the middle of traffic that you need to get out of. There may not be enough space to do a crossover or spin move (which we'll discuss later), so your only option may be to control dribble backwards until the pressure is relieved. Perform a control dribble, but after you dribble 3-4 times forward, stop for a few dribbles while protecting the ball with your off hand and then back up while dribbling a couple of dribbles. You should be positioned exactly as you would be for the control dribble. The only difference is that your feet are moving backward instead of forward. After you dribble back for 3-4 dribbles, go forward again. Purpose: Most of the time when you dribble the ball up the floor a defender is guarding you and trying to influence your direction from side to side. This dribble is used to change the angle of your direction. Dribble the ball with your right hand while heading slightly to the right side of the court. After 3 or 4 dribbles, plant your right foot and cross the ball over to your left hand with one bounce while heading at an angle to the left side of the court. After several dribbles, plant your left foot, cross the ball over to your right hand with one dribble, and head back toward the right side of the court. Repeat this zig-zag pattern back and forth until you reach the end of the court. For the crossover to work, it's important that you move up the court in a zig-zag pattern instead of in a straight line. By dribbling toward one side of the court, you pull your defender over to that side. Then, when you crossover, you get a bit of a head start in the new direction. When your defender catches up to you and overplays you on the left side you crossover to the right and gain another step advantage. Caution: This is a dangerous move if your defender is guarding you closely. The ball may be easy to steal if you cross it where the defender's hands are. Purpose: When you need to change your direction but you're being too closely guarded to cross the ball in front of you. Keep your off hand (arm bar) bent out front to protect the ball. Ball is dribbled by your back foot with your opposite foot near the defender. Dribble the ball with your right hand while heading slightly to the right side of the court. After 3 or 4 dribbles, plant your left foot (should be your front foot that is closest to the defender), do a half-spin backwards keeping your stomach away from the defender while pulling the ball around with you, and head off toward the left side of the court. After several dribbles, plant your right foot (front foot, closest to defender), do a reverse pivot off the right foot keeping your stomach away from the defender. Pull the ball around with you using a single dribble and head back toward the right side of the court. To be most effective, you need to move in a zig-zag pattern. If you go in a straight line up the court, you're not really changing direction, so your defender has no trouble staying with you. Caution: This is a dangerous move if you're unaware of defenders planted behind you. You could find yourself spinning directly into their hands. Purpose: Once your defender thinks you're doing a reverse spin, he'll adjust his body to try to stop you from going the new direction. By faking the reverse, you'll gain a step on him and be able to dribble by. Follow the instructions for the spin move. However, when you get to the point where you plant your front foot, do a half-spin backwards and pull the ball around to the front. Instead of changing direction, spin right back in the direction you came from. Purpose: A good way to change direction using your legs to help protect the ball. Dribble the ball with your right hand while heading slightly to the right side of the court. After 3 or 4 dribbles, plant your left foot (should be your front foot that is closest to the defender). With your left foot out front and your right foot back, push the ball between your legs to your left hand. Dribble at an angle toward the left side of the court and plant your right foot (front foot, closest to defender). Push the ball through with one bounce to the right hand and head off at an angle to the right side of the court. Once again, the movement should be in a zig-zag pattern to force the defender to change position. This is a more advanced dribble. Purpose: A good way to change direction using your body to help protect the ball. Dribble the ball with your right hand while heading at an angle to the right side of the court. After 3-4 dribbles when your left foot (opposite of your dribbling hand) is out front, pull your hips forward so you can pass the ball behind your back with one dribble to the left side. You actually push it toward the left and then run that direction to catch up to it. Catch it by dribbling with your left hand. Dribble 3-4 times with your left hand at an angle to the left, plant your right foot, pull your hips forward, and pass the ball back to the right side by using one dribble behind your back. Catch up to it with your right hand and repeat. It's important to pull your hips forward or it will be very hard to get the ball across your body without hitting your backside. It's also important to push the ball out to the side in the direction you will be turning or it will be hard to catch up to the ball. Purpose: This combination allows you to back out of pressure with the backup dribble to create enough space from your defender to crossover to change direction. Perform the retreat dribble. After you back out of pressure, cross the ball over to the other hand (using the crossover dribble) and advance in that direction for 3-4 dribbles. Do the retreat dribble again for 3-4 dribbles, and cross the ball over to the other hand. Repeat in a zig-zag pattern up the court. Purpose: Combine these 2 drills for more a more challenging change of direction drill. Start dribbling to your right with your right hand. Change direction by dribbling through your legs to the left side (using the between the legs dribble). Continue to the left. When it's time to change direction, dribble behind your back to the right side (using the behind the back dribble). Continue up the floor alternating skills. Purpose: This is not a skill you can use in a game, but it's included in these youth basketball dribbling drills because it works on coordination and hand control. Hold the ball in your right hand at your right side. Take a long stride with your left leg. Pass the ball through the inside of your left leg to your left hand. Take a long stride with your right leg and pass the ball through the inside of your right leg back to your right hand. Continue to stride down the floor, passing the ball back and forth between your legs as quickly as possible. Now try to perform the drill while striding backwards. Instead of passing it from hand to hand, push it from one side to the other with one dribble between your legs. With the ball in your right hand, take a long stride with your left leg. Bounce the ball once with your right hand, so that you can receive it with your left hand. Take a long stride with your right leg and push the ball back through your legs with one dribble to your right hand. Continue to stride down the floor, dribbling the ball back and forth between your legs as quickly as possible.